Drop Dead Fred: Where's the rest of the toys? Drop Dead Fred: Grown up? Elizabeth (Phoebe Cates) is a shy young woman in a doomed marriage to a womanizing cad named Charles (Tim Matheson, who long ago perfected this type of role); she wears modest ankle-length dresses, has incredibly bad luck, and has the further indignity of being the daughter of an uptight, controlling mother (Marsha Mason). As Elizabeth's life goes from bad to worse, she finds a long-lost jack-in-the-box in the back of her closet, and releases her wildly uninhibited imaginary friend from her childhood, the manic Drop Dead Fred (The Young Ones' Rik Mayall). That's the setup of this 1991 comedy that bounces back and forth from innocent comedy to mean-spirited drama to innuendo-laced humor and back again, as Elizabeth has to come to terms not only with the destructive actions and presence of Drop Dead Fred, but with her mother, her husband, and her life in general. The crazed Fred calls Elizabeth "snotface," refers to her mother as "the megabitch," and spends an inordinate amount of time on the floor looking up women's dresses. The idea that Fred will somehow reconcile Elizabeth's marriage, however reluctantly, is offset by the appearance of another childhood friend, Mickey (Ron Eldard), and if you can't figure out who she'll end up with then you haven't seen enough lightweight comedies. 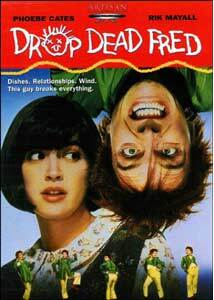 A lot of comedies start out strong, and eventually peter out as the jokes run thin, but in Drop Dead Fred it is actually the other way around; the humor and comedy is incredibly forced during the first 40 minutes or so, so much that so it is almost painful to watch. Mayall's Fred is much too mean and far too manic to be remotely likeable during this stretch. It is only when the story kicks into the second half, when Fred's demeanor softens dramatically and builds to a point where he is actually not just likeable, but darn near selfless in his concern for Elizabeth. There are inspired moments—such as a psychiatrist office sequence where a group of imaginary friends run into each other and talk about old times, or the genuinely funny slapstick done by Cates in a restaurant are few—but they come far between in a film that relies too much on dog poo jokes and pointless sidebars, such as Elizabeth's friend Jane (Carrie Fisher), who lives on a huge paddlewheel houseboat that seems to exist for no other reason than to sink, thanks to Fred. The semi-sweet conclusion doesn't match the mood and tone of much of the occasional sexual humor or the serious mother issues that come up in Drop Dead Fred, and despite a cute-as-a-button performance from Cates, the film is really all over the road. Image Transfer Review: An ugly, open-matte 1.33:1 full-frame transfer is all that's offered on this release from Artisan. Smeary colors, muddy blacks, heavy grain and incessant specks are the order of the day, and though some daylight sequences look decent enough, any indoor scenes (or those taking place at night) look simply horrible. The backcover touts confusingly that Drop Dead Fred was "formatted from its original version to fit your screen" AND is "presented in 1.33:1 format in which the film was shot". Huh? Audio Transfer Review: Audio come across slightly better than the image transfer, and while the Dolby Digital 2.0 mix is no great shakes, it is more than adequate. Dialogue is hiss-free and presentable, with just a hint of directional imaging to fill out the front channel soundstage. Extras Review: The extras cupboard is bare on Drop Dead Fred. The disc, though, is cut into 25 chapters, and includes English closed captioning. This 1991 variation on Beetlejuice (troublesome, non-human character causing wacky, cartoon-ish hijinx) has some funny moments, but as a whole is uneven and can't seem to decide it is made for kids or adults. Some of the humor and language seems a bit too sexual for young viewers, and the premise of the film is often too immature to appeal strictly to adults. Drop Dead Fred is a guilty pleasure for a lot of people, but Artisan's slapdash treatment of the image transfer makes this release seem more like a rushed obligation than anything else.